Obama does it again with his on the one hand, "on the other hand" rhetoric, where the "on the other hand" is almost always a statement of how the United States of America or of how Christians have "also" done something bad that dear leader needs to apologize for. 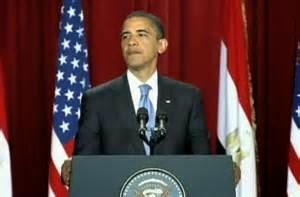 Obama used this disgusting "on the other hand" technique against Jews in his Muslim "outreach" [i.e., I'm one of you] speech in Cairo in 2009, in one of his first acts after being elected president. After admitting that the Jewish people suffered horrible atrocities in the Holocaust, he made this disgusting moral equivalency with his "on the other hand" that followed. This from the great Yid With Lid Blog: "On the other hand, it is also undeniable that the Palestinian people - Muslims and Christians - have suffered in pursuit of a homeland. For more than sixty years they have endured the pain of dislocation. Many wait in refugee camps in the West Bank, Gaza, and neighboring lands for a life of peace and security that they have never been able to lead. They endure the daily humiliations - large and small - that come with occupation. So let there be no doubt: the situation for the Palestinian people is intolerable. America will not turn our backs on the legitimate Palestinian aspiration for dignity, opportunity, and a state of their own." Barack Obama has also used this technique many times since, mostly to apologize for how bad the United States of America has been B.B. - Before Barack. But now the president has gone beyond the pale. At the annual prayer breakfast on Feb. 5, 2015 in the morning, while talking about the terrible atrocities that are being committed in the name of religion [and which religion is that president Obama?] Obama just couldn't leave it at that. This time he gives what I call a pre-emptive "on the other hand" phrase, that I think goes beyond the pale. "At the National Prayer Breakfast, President Obama reminded attendees that violence rooted in religion isn’t exclusive to Islam, but has been carried out by Christians as well. What? Obama doesn't even dare mention the word Muslim or Islamic or Islamists in regards to the evil that is going on today, but has to go back to the time of the Crusades and slavery, to tell how evil acts Christians did "in the name of Christ." I am Jewish and not a Christian, but that really was upsetting to me. What really got me was his "unless we get on our high horse" comment. So, in other words, anyone who dares call out the the Islamic terrorists today and the evil acts they are committing is essentially "getting on their high horse" by pointing that out. Christians, get off your high horse talking about evil Islamic terrorists. Jews, get off your high horse talking about evil Nazis. Muslims...can't say anything bad about you because you're the religion of peace. Update: The Five panel on the Fox News Channel gave some great must hear commentary on Obama's moral equivalent comparison between Christians and ISIS, on their show on Thursday Feb. 5, 2015. Here is a video of most of that commentary. Obamas comments were offensive, ignorant and embarrassing ---- as a Jew , I am offended also that he equates something from 1100 years ago to the present Islamic terror, as if that justifies it- Every Christian, Jew, American should want to puke in his face at such a remark. Now tell me what you really think brother Brad. :-) I agree by the way! Yes, I felt sick when I heard this today. Unbelievable and so disrespectful, to say the least, at the Prayer Breakfast. I know Joel. It is almost mind boggling that this is the president of the United States. What has happened to this country? Thank you for posting The Five's video. Eric Bolling said it best. This comment will haunt the President. So outrageous and, really, quite sad, like you said, that our President would say this.